James Harrell is a fifth generation farmer who has been around peanuts his whole life. Virginia Gold is the perfect blend of his family’s commodity farming and his love of coffee. 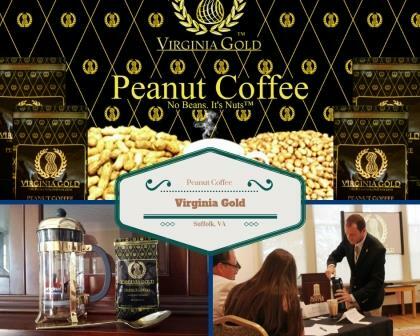 Peanut coffee is a new, proprietary product pioneered by Virginia Gold™, Inc. Peanut coffee is not a peanut flavored coffee. Instead, peanut coffee is best recognized as a beverage primarily composed of peanuts, grown right in Suffolk Virginia!